New Trump Adviser H.R. McMaster Faces An Old Challenge — Iraq : Parallels McMaster first made his name as a captain in Iraq in 1991. Then, in 2007 he was a key figure in the "surge." Now, 26 years after he first went to Iraq, he'll be seeking a solution in his new post. Lt. Gen. H.R. McMaster looks on as President Trump announces him as his national security adviser at Trump's Mar-a-Lago resort in Palm Beach, Fla., on Monday. The captain and his men sat and watched from a distance as Saddam's army regrouped and crushed an uprising by Shiite rebels in Nasiriya and other cities throughout southern Iraq. "The rebel leaders begged us for weapons," said the captain, explaining that he was not allowed to help them. Later, the rebels returned and pleaded with the U.S. forces to simply drive into the city, believing that would scare out the Iraqi army. "All we could do was wish them luck," the American officer said. That captain was H.R. McMaster, then just 28. 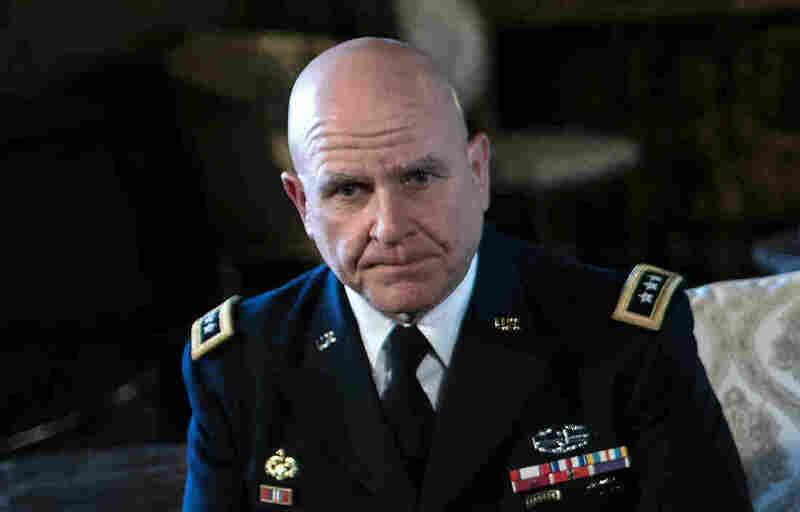 McMaster, now 54, has since put away his desert camouflage and today wears three stars and a chest full of honors. But as President Trump introduced him as his new national security adviser on Monday, McMaster essentially faces the same challenge as 26 years ago — how to fix Iraq. This time, he must try to do so from within the White House, as one of several top aides competing to make policy both within and outside of the formal National Security Council. Based on McMaster's track record, he may not shrink from dealing candidly with Trump's other staffers. "The president doesn't have a lot of experience in national security policy, in military policy," NPR Pentagon correspondent Tom Bowman told NPR's Morning Edition. "But let me tell you something: This guy (McMaster) is no shrinking violet. He's very blunt, he's very smart, and he's not going to suffer fools gladly." Before the 1991 Iraq invasion, the U.S. had never fought a full-fledged war in the Middle East. Since then, the region has been the military's main focus, and that looks likely to continue during the Trump administration. The U.S. is currently involved in wars in Iraq, Syria and Afghanistan and carries out periodic airstrikes elsewhere in the region. While Trump's national security policy is still taking shape, he has now become the fifth consecutive commander in chief to carry out military action in Iraq. Here's the condensed version of 26 years of U.S. military history in Iraq: President George H.W. Bush ordered Saddam kicked out of Kuwait, but left the Iraqi dictator in power. President Clinton upheld a no-fly zone over northern and southern Iraq, but did not dislodge Saddam. President George W. Bush invaded Iraq and toppled Saddam in 2003, and the Iraqi insurgency followed. President Obama withdrew the final U.S. troops at the end of 2011, but ordered airstrikes in August 2014 to counter the emergence of the Islamic State. Obama later ordered thousands of American troops into Iraq and Syria to help indigenous fighters against ISIS, the strategic situation that Trump and McMaster inherit today. To put this in perspective, 26 years before McMaster first charged into Iraq in 1991, the U.S. was just ramping up its involvement in Vietnam in 1965. McMaster's long history with Iraq is a sobering lesson of just how tough his job will be. He earned a Silver Star in 1991 for heroism in a massive tank battle known as "73 Easting." During the second Iraq War, he was considered one of the architects of the 2007-2008 surge that beat back the Iraqi rebellion. In between his stints in Iraq, McMaster, a West Point grad, earned a doctorate in military history from the University of North Carolina. His dissertation expanded into a highly acclaimed 1997 book on the Vietnam War, Dereliction of Duty: Johnson, McNamara, the Joint Chiefs of Staff, and the Lies That Led to Vietnam. The central theme is generals who deferred to politicians and came to regret it. As he moves into his White House office, McMaster's most immediate challenge will be helping to coordinate the effort to drive the Islamic State out of its last stronghold in Iraq, the western side of Mosul. The Trump administration has inherited an operation in midstream. With the U.S. providing air power and advisers to the Iraqi military on the ground, ISIS was recently pushed out of the eastern part of the city in fighting that took roughly four months. Iraqi Prime Minister Haider al-Abadi on Sunday announced the offensive to take the western part of the city, which is bisected by the Tigris River. If ISIS is uprooted, it will no longer hold any urban areas in Iraq and would be a greatly reduced force from the one that spread across Iraq in 2014. But as McMaster knows all too well, military victories in Iraq are ephemeral without a political solution that follows. It's a lesson he's relearned many times over the past 26 years. Greg Myre, an NPR national security correspondent, covered the 1991 Gulf War for The Associated Press. Follow him @gregmyre1.